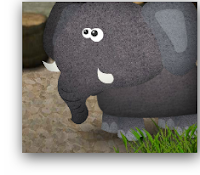 GoAnimate has introduced another Type a video, Quick Template only theme with their new Wildlife Animals cartoons. Mathieu Leader, a.k.a Cartoon King, who recently did some voice acting for me on Harry Chalk 3, has put together this humorous animation featuring the theme's elephants. These quick templates are actually a lot of fun to just pass the time with. You can't really save your animation mid process which means you know going in that you're probably only going to spend an hour or two at most creating an animation. It may not sound very creative but from a script writing point of view it's not a bad way to practice writing short funny sketches or humorous anecdotes without all the extra effort of animating it as well.